Elta MD UV Clear Broad-Spectrum SPF 46 - 1.7oz New! FRESH! Fast Shipping! SALE! 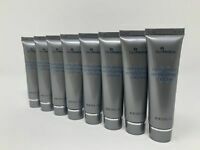 SkinMedica Replenish Hydrating Cream .25 oz 8 Pack FULL SIZE EQUIVALENT! Fresh! Epionce Milky Lotion Cleanser (6 oz 170 ml) Authentic! Fast Ship! New! SALE! Dermalogica Age Smart Daily Superfoliant 2 oz / 57 g! NEW! FAST SHIP! SALE! Argan Oil Body Moisturizer Lotion 18 Fl.Oz Mega Size W Acai Berry Extract. This sun screen is the only one I have found that can be worn under makeup without effecting the makeup!. It glides on and leaves no white residue or heaving coating on the skin. The price is amazing for the quality of this product. In order to protect your face from the harmful effects for the sun, sunscreen is required and if you also use makeup this is the product for you. I love wearing alone as well. Again, no sticky white or think gunk on your face. I used to use Clinique sunscreen, but my dermetalogist recommend Epionce. it has been 2 years that I use it and really like it.